Teased for some time via Leaf's Twitter account, 2017 Leaf Pearl takes their multi-sport coverage to another level. There is even an assortment of non-sport figures to be found, but the majority of the set sticks with the action from the field, court and ice. 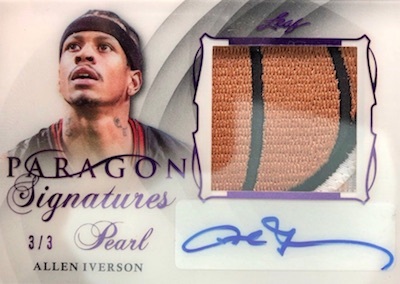 Each box comes with 11 cards and a four-figure price tag. The boxes are hand-numbered to 300, and the cards are individually packed in drawstring bags. Taking the name quite literally, the 2017 Leaf Pearl base cards embed a pearl into the attractive design. 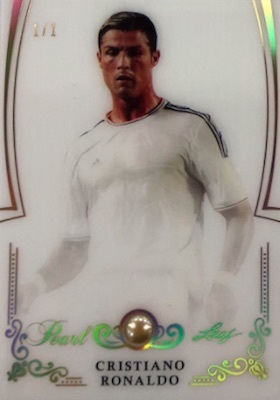 Topping out at 10 copies for the base, there are also five color parallels, including the one-of-one Gold. Joining five different Shohei Ohtani editions among the autographs in the 2017 Leaf Pearl checklist are legends of baseball, basketball, football and soccer. 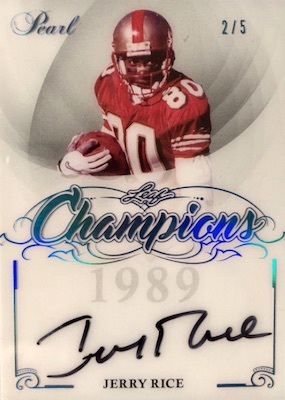 In addition to the base Signatures set, themed inserts include Champions Signatures, for those at their best when it matters most. 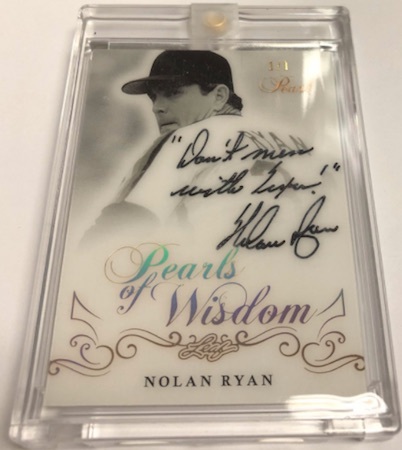 Beyond that, Paragon Signatures adds a memorabilia swatch, while Pearls of Wisdom provides enough room for a large inscription. 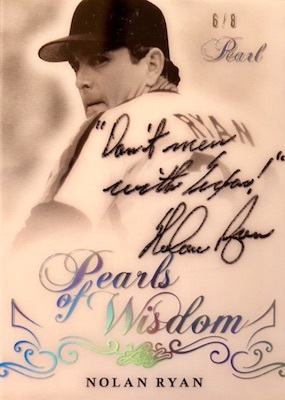 Allowing for more variety in the 2017 Leaf Pearl lineup, Pearl Cut Signature includes notable names from history, like Abraham Lincoln and Marilyn Monroe, along with sports legends such as Lou Gehrig. The History Book Cut Signature book cards showcase an impressive relic piece for Mickey Mantle and Babe Ruth alongside a cut autograph. Finally, there are multiple options to pursue with the 2017 Leaf Pearl memorabilia cards. 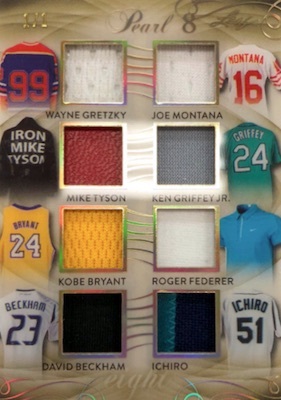 Pearlescent Patch includes jumbo swatches of game-used or event-used gear. 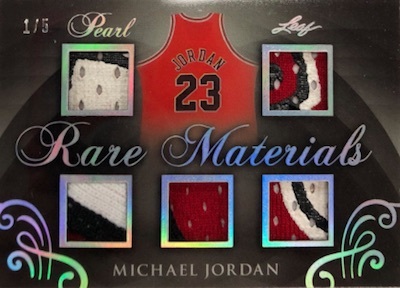 On the other hand, Rare Materials offers five smaller pieces for one elite player. 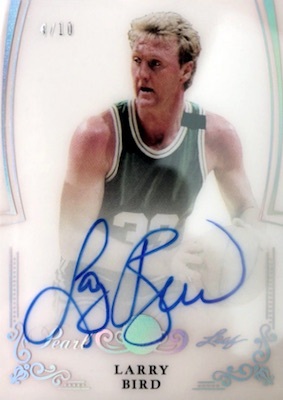 Tying together multiple athletes on one card, The Year in Sports focuses on the five biggest names from a given year. There are also multi-player Pearl 4, Pearl 6 and Pearl 8 relic versions. 2017-18 SERGEI FEDEROV LEAF PEARL HOCKEY PARAGON SIGNATURES AUTO RELIC 1 1 !!! 2017-18 Leaf Pearl Gordie Howe 3 3 Autograph Auto Platinum Parallel "Mr. Hockey"
2017-2018 Leaf Pearl Hockey Authentic John Philip Sousa Cut Signature Auto 1 1 ! 2017 18 Leaf Pearl Gerald Ford Signature Auto 3 8 US President Beautiful Auto! Buy 2017 Leaf Pearl cards on eBay. 54 cards. Serial numbered #/10. HOLO PARALLELS: Platinum #/5, Purple #/3, Green #/2, Gold 1/1. HOLO PARALLELS: Platinum #/5, Purple #/2, Green 1/1, Gold 1/1. HOLO PARALLELS: Platinum #/4, Purple #/3, Green #/2, Gold 1/1. HOLO PARALLELS: Platinum #/4 (Card #5 - #/3), Purple #/3 (Card #5 - #/2), Green #/2 (Card #5 - 1/1), Gold 1/1. HOLO PARALLELS: Platinum #/5 (#02) or #/4 (#01), Purple #/3, Green #/2, Gold 1/1. 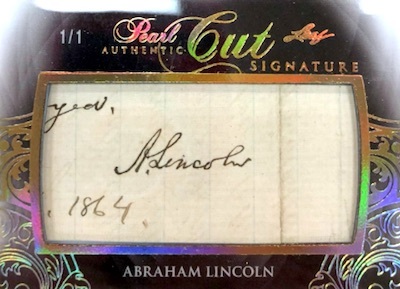 HOLO PARALLELS: Platinum #/5 or #/4, Purple #/4 or #/3, Green #/3 or #/2, Gold 1/1. HOLO PARALLELS: Platinum #/3, Purple #/2, Green 1/1, Gold 1/1. 3 cards. 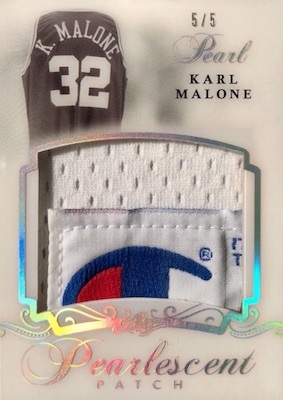 Serial numbered #/8. HOLO PARALLELS: Platinum #/3 (Munson,Musial #/2), Purple #/2 (Munson 1/1), Green 1/1, Gold 1/1. 4 cards. Serial numbered #/8. View the 2017 Leaf Pearl checklist spreadsheet. This product has a very beautiful appearance and quality to it. I’m curious to know if anyone has information on the Pre-Production cards out there that don’t match the set checklist?